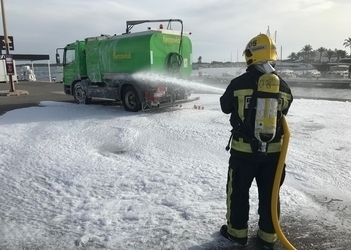 The president's office of the Formentera Council reports that local firefighters were joined by members of the local police, harbour police and civil defence as they took part in an exercise involving a simulated fire affecting a fuel lorry near the petrol station in La Savina harbour. Typically performed once yearly, simulations of this kind are part of the port's safety strategy and serve to measure the time emergency services take responding to fires and spills. Today's simulated incident involved the unloading of a fuel lorry with a defective hose that caught fire after suffering an initial leak. The operation consisted in getting the leak under control and then extinguishing the fire all while maintaining safe conditions in the surrounding area and keeping flames from spreading. Department head Bartomeu Escandell said the exercise was about “gauging collaboration between the port authority and the distinct security and prevention forces of the Formentera Council in emergency situations”. Escandell highlighted the island's recent deployment of a fire engine belonging to Balearic port authority, “it's an extremely useful tool that will help us improve how we prevent and put out fires, both in La Savina's harbour and across the island”. Beginning at 10.00am and finished by roughly 10.45am, the simulation saw the participation of four firefighters with heavy goods vehicles, six civil protection volunteers with two vehicles, four officers on the local police force and another two from the harbour police. The president's office of the Formentera Council, whose remit includes the island's beach lifeguard and rescue service, reports that the service's annual halt in summer operations took place last week. The team worked from May 1 to October 31. 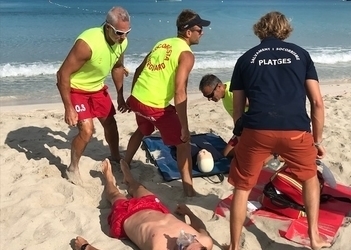 For six months, a team that numbered as many as 23 lifeguards “worked to assure the safety of Formentera's beaches and swimming areas”, noted department head Bartomeu Escandell, who highlighted the “dedication and professionalism” of the team. Lifeguards responded to 3,025 cases involving everything sun burns to spills, cuts, scrapes and bumps. They also assisted in stings by greater weever (a poisonous fish), sea urchins and jellyfish—at 2,992, this last group was the largest. Seventy individuals were rescued from potentially dangerous situations in the water, a type of rescue most common when the yellow flag flies, which means beachgoers can still swim but are encouraged to apply caution, something some fail to take into account. Another twelve rescues happened involving individuals on boats. Likewise, a total of 23 people were taken to hospital in ambulance. The president's office is saddened to report on three deaths that occurred this season at Cala Saona. One person died after going into cardiopulmonary arrest while in the water, a second suffered a heart attack in the sand and a third threw themself off the cliffs near the beach at twilight. Red-flag days, when swimmers are expressly banned from entering the water, made up for 62 days this summer. In addition to on-the-clock duties, the team also intervened to provide emergency assistance to crews of ships involved in accidents, and helped tow watercraft during off-duty hours. Arenals and Es Pujols beaches feature accessible-swimming options for individuals with reduced mobility. The service, available from 12 noon to 5.00pm when the green flag flies, was requested this year by 37 people. All lifeguard posts without exception are fitted with defibrilators to assist in cases of possible cardiopulmonary arrest. CiF chief Jaume Ferrer was joined this morning by Joan Gual de Torrella, port authority president of the Balearic Islands, in unveiling the local fire brigade’s newest addition–a fire engine. 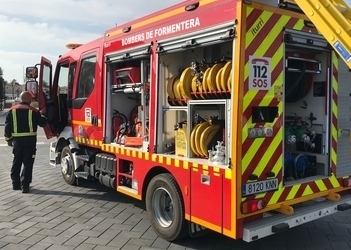 Autoritat Portuària de Balears facilitated the lorry’s transfer as part of a deal which, in addition to the fire engine, also includes €20,000 yearly to help train firefighters and purchase firefighting gear. Ferrer framed the gift as just another sign of the warm relations bonding the administration and APB: “The mutual understanding we have has meant improvements in the port and an upgraded arsenal for the Council fire brigade”. Ferrer framed the acquisition as a “crucial to a decent firefighting service in the port” and said it would be “fundamental to the brigade’s work moving forward”. The fire engine, a six-person, water pump-equipped light lorry with capacity for 1,800L, is designed both for fighting fires and lifesaving and rescue operations. Battery-powered technology even features in an on-board holding cell for traffic accident arrests. The vehicle’s wide-ranging functions, not to mention on-board availability of firefighting, rescue and lifesaving material, make it highly versatile, its size, meanwhile, means there is greater ease of handling. Similar models are already being used on the ground in Murcia, Segovia and Castelló. The fire brigade wishes to remind islanders that the fire ban was lifted October 16, meaning outdoor fires are now permitted in the Balearics away from wooded areas, in recreational areas and designated sites. Permission from the Council must be obtained prior to any fires in wooded areas. If your home does not have surrounding trees or a safe wooded buffer zone, visit the forest stewardship service’s website or speak with an environmental agent of the Govern balear about how to request the necessary permits. Gathered in plenary today, members of the Formentera Council green-lighted an approval measure for a deal to delegate building of Sant Ferran's school and nursery (escoleta) to IBISEC. Today's step precedes the actual signing of the deal by Govern and Council, which will in turn set in motion tender of the project and the build itself, executed by IBISEC. The Council is tapping municipal coffers to fund 16 per cent of the future escoleta's VAT-including €6.9-million price tag. Education secretary Susana Labrador welcomed the bipartisanship on display as council members voted to move forward with construction, describing the new schools as “infrastructure our children need to learn”. Assembly members were united in support for initiating the first stage in the approval process for Formentera's gender equality plan, or pla d'igualtat, for 2019 to 2022. Social welfare secretary Vanessa Parellada emphasised how important support for the equality plan was to “helping islanders juggle work and family and promoting equality in leisure and sport”, both of which she called “crucial to a more equitable culture and gender violence prevention”. Initial approval also came for the administrative underpinnings of the island's future funeral parlour and a tax ordinance for mortuary services as council members congregated at the conference hall of the island's dependent care facility. 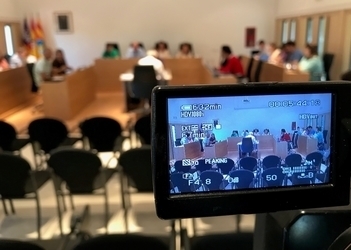 Senior cabinet members from the Gent per Formentera party won consensus on proposals relative to the Council's adhesion to a regional hiring service and the Consell d'Entitats's membership rolls. The Popular Party won the backing of the full chamber for upgrades on a drainage pipe at the island's nature reserve and the six-am ferry from Formentera to Eivissa. Comments on the measures were also submitted by the advisory committee. When a PSOE proposal about the bid to regulate boat moorage on the Estany des Peix shoreline scored “yes” votes from everyone but GxF party members, the latter countered by proposing a transactional solution which was ultimately adopted. Compromís operatives won support for a proposal on Spain's public employment service (SEPE) and the advisory committee again suggested improvements. Another measure, which senior cabinet members successfully lobbied to make transactional, was about emergency ambulances. Following secretary Alejandra Ferrer's turn appraising assembly members of efforts underway in the land and tourism departments, the administration's official pronouncement concerning the International Day of Action for Trans Depathologisation closed the session. The president's office of the Formentera Council wishes to advise islanders that Formentera is currently on orange alert based on Aemet's forecast of rain and storms on Eivissa and Formentera. Experts say the showers could increase in intensity this afternoon. In light of forecasted heavy rainfall and storms from this afternoon until tomorrow morning which could leave potentially dangerously large amounts of water in their wake, the Council is urging caution and discouraging both unnecessary car travel and parking in areas prone to flooding. If you are in danger or involved in an accident, the 112 emergency assistance service is in charge of any storm-related operations. In related news the municipal pool will be closed from 2.00pm.